The world’s most popular budget CPU just got better! 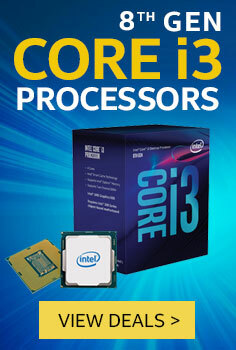 Evetech is proud to announce the launch of the 8th Generation Intel Core i3 processors. PC unable to keep up with the latest games? Constant stuttering in multiplayer games proving to be a disadvantage? But limited by budget? You’re at the right place! The Intel 8th Gen Core i3 CPUs were crafted with two key focuses – affordability and maximum performance. This lineup of processors is so powerful that they even outstrip the last generation Core i5 processors! Featuring a whopping 50% more processing cores compared to last generation, the Core i3 quad-core CPU is a slam-dunk when it comes to raw performance at a budget price. Add to this the reliability and powerful single-core performance that Intel always brings, and you get a processor that can hold its own against the very best in the market. 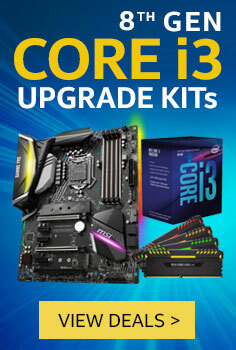 Choose from 8th Gen Intel Core i3 Upgrade Kits, Gaming PCs, and Workstation PCs to launch yourself into Intel’s latest, most powerful budget offering to date with minimal effort. Kiss performance issues goodbye! 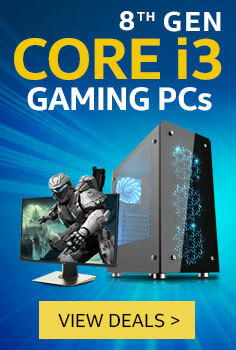 Bring home your Intel Core i3 today; experience premium computing at a truly entry-level price. Budget. Performance. Never seems to hit the mark. There’s always some kind of trade-off. Right? The 8th Gen Intel Core i3 processors are here to change that perception for good. Featuring 4 powerful physical cores, these CPUs are here to disrupt entry-level computing as we know it. However, if you’re still unsure about whether you need this upgrade or not – here are top 5 reasons why you might! 50% more performance. Two additional cores added to the Intel Core i3 lineup points to the inevitable demise of the dual-core era. Demanding games, the latest programs, and even the newest operating systems need more power than a dual-core CPU can provide. The 8th Gen Intel Core i3 quad-core CPU brings unprecedented performance all previous i3 processors and even beat out some previous generation Core i5 CPUs. Entry-level price. These processors are designed for those on a tight budget. 4 physical cores will become the norm with this move, and you will notice the difference with lesser stuttering in games, faster application switching, and better all-round responsiveness. Future proof. Compared to the previous generation core i3 dual-core processors, these CPUs will last longer, while outperforming them on all fronts. Excellent choice for premium gaming on a budget. For those who want to play the latest games without a hitch – this is a great starting point. Easily maintain consistent framerates with these quad-core processors, and stop dealing with constant stuttering and framedrops. After all, nothing kills total immersion more than bad performance. Integrated DX12 Intel HD 630 Graphics and Intel Optane™ Support. The 8th Gen Intel Core i3 comes equipped with the latest technologies from Intel for out-of-the-box graphics processing – handling high-resolution videos with ease. Moreover, Intel Optane support provides an excellent and cost-efficient path to speeding up your PC even further. Entry-level processors can no longer be looked down upon, as Intel changes the game with the 8th Gen Core i3 CPUs. 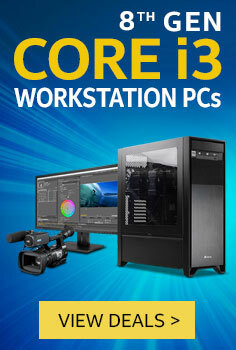 Evetech offers the best deals on Core i3 processors in South Africa. So, grab yours today and experience a seamless computing experience at an unbelievable price!